According to Wikipedia, during the pre-dawn hours of 1 April 2017, locally heavy rain triggered flash flooding and landslides in the city of Mocoa, Putumayo, Colombia, killing at least 316 people, injuring 332, and leaving 103 others missing. Technically, the tragedy was not a landslide but rather a mud-flow triggered by many landslides. For some analysis of the cause of the tragedy see the Landslide Blog. It was predicted in 2014. DigitalGlobe, as part of its Open Data program, has recently released satellite imagery of the location. Although we knew about the event soon after it happened we had not expected to see any imagery as Mocoa is in a region that has near constant cloud cover making it difficult to photograph. DigitalGlobe provides the imagery divided up into squares of 1Gb files with no compression. So even a completely black square that is off the edge of the main image is a 1Gb download! There is a preview of the whole image, but we still ended up downloading almost all the squares to find the right ones as there are no previews of the individual squares. Mocoa, Columbia, as seen in DigitalGlobe imagery. Keep in mind that what we are seeing is the debris left behind from the flood. The actual flood waters probably covered some of the houses. 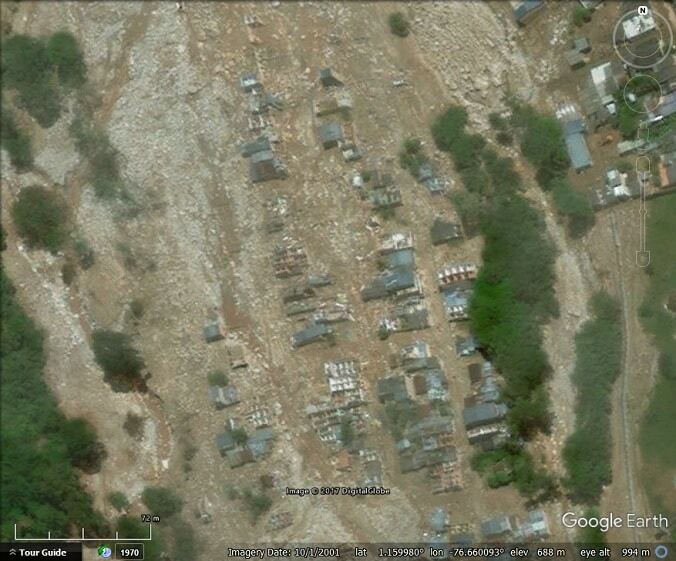 We didn’t download the ‘before’ images from DigitalGlobe so we haven’t done a ‘before and after’. The imagery in Google Earth is so old that such a comparison is not very informative as the town had expanded considerably since the last Google Earth image. We have cropped and compressed the part of the imagery showing the town of Mocoa and created an image overlay for you to view in Google Earth . The post The Mocoa Landslide in DigitalGlobe imagery appeared first on Google Earth Blog. DigitalGlobe, as part of its Open Data program, has recently released satellite imagery of the location. Although we knew about the event soon after it happened, we had not expected to see any imagery as Mocoa is in a region that has near constant cloud cover, making it difficult to photograph. 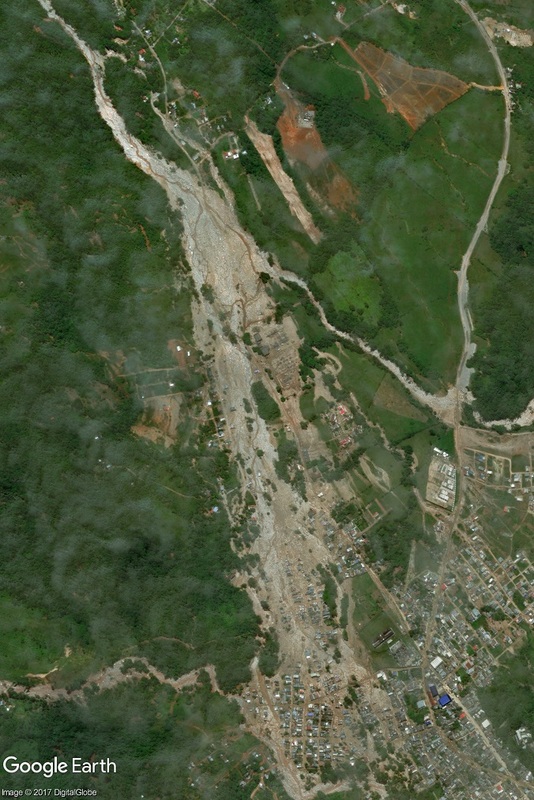 Mocoa, Colombia, as seen in DigitalGlobe imagery.